Our wedding mandaps are professionally designed with proper spacing and theme. These wooden mandaps are strong enough. Customization is available as per one's preference and need. 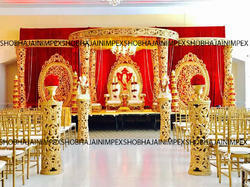 Being a quality centric organization, we are committed to offer our clients an appreciable range of Wedding Mandap. 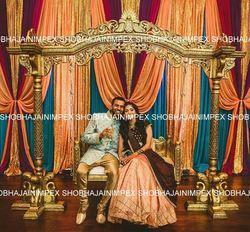 Shobha Jain Impex was incepted in 1996 and since it started its operation, the firm has been involved in the manufacturing, supplying and exporting of Wedding Decoratives Items. 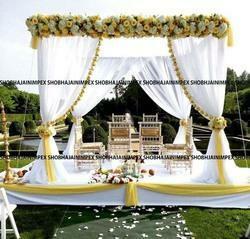 Our services include Wedding Mandap, Wedding Stages, Wedding Furnitures and other decorative items. Our service doesn’t get restrict here; we are specialized in offering almost everything which is needed in a wedding. We understand our clients demand and their desire and accordingly we deliver them the right stuff. The whole ranges of our products are manufactured under a supervision of an expert, meeting the industry parameters. Our products are available in a wide variety of designs, colors, appearance, and in different sizes. A wedding is a lifetime experience and thus understanding our clients’ emotion attached to it, we bring them an exclusive range of accessories which increases the beauty of wedding venue. Our range of products is suitable for any function and ceremony, whether it is organized in a hotel, home, restaurant, open area or indoor. We fit in any kind of ceremony, a small gathering or large. We have a team of experts which also includes wedding designers who designs the mandap and other furniture and even their placement. Over the years, we have been able to achieve a reputed position in the market and have also been able to make our presence by reaching the USA, Europe, Middle East and Canada. We have been able to spread our wings all over is simply because of the trust of the clients and their appreciation.